What is a rescue plan and what comprises a thorough plan? What training is needed to facilitate a rescue/retrieval from a confined space? What types of rescue/retrieval may be needed? What is a post-rescue review? What PPE and other products, equipment will be needed? Before any entry is made into a confined space on a job site, everyone involved should be able to answer these questions. The emergency response plan can be modeled after the NFPA 350 best practice guide. Appropriate means for rescue must be determined prior to the start of any confined space entry activities. The procedures set up at your work or job site for emergency rescue for each specific confined space need to be suitable and sufficient. The detailed rescue plan should be documented, reviewed and in place before any person attempts to enter or begins work in a confined space. The rescue plan for each confined space should be reviewed by all individuals involved in the entry each time that space is going to be entered, just like a hazard assessment should be conducted before any entry into a confined space. These plans should be practiced as part of training so everyone knows what to do if a rescue/retrieval situation does arise. You should speak up and not enter a confined space without ensuring there is a plan in place about how to react should a rescue and retrieval become necessary. All confined space rescuers, per the requirements of OSHA general industry and construction regulations, are required to receive annual refresher training. This must include utilizing similar spaces and techniques anticipated at the job site. You’ll find, rescue training covers a wide range of information related to hazardous conditions and all types of rescue equipment. Moreover, rescuers will also require training to prepare for tasks involved with accessing confined spaces, such as descent control, secondary systems, patient packaging methods, dismantling techniques, proper storage of equipment, selection, and use of suitable anchors, as well as the common hazards that pertain to the system and components. Are You Ready if a Rescue/Retrieval Becomes Necessary? Proactively identifying a proper rescue plan, seeking out appropriate training and identifying the right equipment long before any rescue is ever attempted is crucial. You need to be prepared so that if you are faced with saving someone who is stuck, has collapsed, or has ceased to respond from inside a confined space, you are ready for the situation. We know there is a lot to consider when it comes to planning for, working in and rescuing someone from inside a confined space. 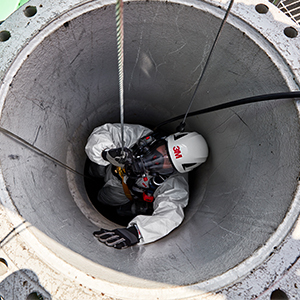 Explore the resources available at 3m.com/confinedspace.